You really have to trust a guy to let him pry open your multi-million dollar, centuries-old Stradivarius and put it back together again. For so many string players over the last half-century, that guy was luthier René A. Morel, 1932-2011, who died Wednesday morning at the age of 79, after a long battle with cancer. His career as a luthier lasted more than 60 years, during which he worked on some of the planet's finest and most valued stringed instruments. The late violinist Isaac Stern referred to Morel as a kind of "doctor" for violins, and he wasn't the only one who felt that way. "If you have to have an operation, if you believe in your doctor, well, René is your guy," said Yo-Yo Ma in a 1995 "Live From Lincoln Center" documentary (video excerpt below). As his longtime assistant Stefan Valcuha said Wednesday, "Almost anybody you can think of came to his shop." Ivan Galamian did, as did Galamian's students -- Pinchas Zukerman, Itzhak Perlman…. "One day I was (at Morel's shop) this year, Elmar Oliviera was waiting to see him, Itzhak Perlman was also getting an adjustment, and he had finished adjusting Yo-Yo Ma's cello and Kurt Nikkanen's violin," said violinist Anne Akiko Meyers Wednesday. "That was one hour of his day." Born in France, René A. Morel came from a family of violinmakers on both sides, and he began making violins at the age of 12 in his cousin's shop, Valcuha said. He worked for Amédée Dieudonne in Mirecourt, as well as Marius Didier, and Bossard Bonnel in Rennes. By the time he was in his late teens, he was making two instruments a week, a pace most luthiers would find extremely impressive, Valcuha said. Morel moved to America after serving in the French Air Force, working briefly in Chicago for Kagan and Gaines. In 1955 he moved to New York, where he worked with Simone F. Sacconi at Rembert Wurlitzer's shop. He opened his own shop at Jacques Français, Rare Violins, Inc. in 1964, and in 1994 opened René A. Morel Rare Violins in the same location. In 2008, he began a collaboration with Tarisio that lasted until his death. Violinists speak fondly of their trips to see Morel, who could adjust a fiddle like no other. "I first met René while I was still a student at Peabody," said violinist Igor Yuzefovich. "I was playing on a Tononi violin loaned to me by the school, and it needed a few minor adjustments. My teacher, Victor Danchenko, suggested that I go and see Mr. Morel for any work on an instrument of that caliber. I couldn't think of a better reason to take a day trip to New York." "I took the elevator up to the 11th floor and was buzzed in through the glass doors by an always friendly Puerto Rican lady behind the counter," Yuzefovich said. "Over the years, I had gotten to know her a bit as well, and was always greeted with a big smile and an occasional hug." "René met me in his usual blue apron, and ushered me into the back corner room. I remember that he listened to me play for about 20 seconds, then took the violin and fiddled with it for a few seconds and handed it back to me," Yuzefovich said. "My face changed when I played a few notes - it sounded like a completely different instrument." "René's incredible talent laid not only in his ability to adjust and repair an instrument, but also in his innate ability to know exactly what a performer is looking for just by watching and listening to how the player plays," Yuzefovich said. "It seemed as if he knew exactly what I was trying to get out of the instrument before I even said anything. " "At the end of our short session, he mentioned to me that in case I find myself in need of an instrument for a big solo performance, I should not hesitate to call him," Yuzefovich said. "After many trips back to Mr. Morel's shop, that opportunity did come for me. I had a performance of the Shostakovich Violin concerto coming up, and was wishing I had something a bit more powerful in my hands for that concert. Over the phone, René sinmply said - come up to New York, I am sure we will find something. Once there and back in the familiar room, the walls of which were covered with signed pictures from seemingly every famous violinist from the 20th Century, René brought out two violins and laid them in front of me. He said "Try these" - and left the room. In front of me lay two gorgeous instruments: a Strad and a del Gesù. "I spent about 4 hours in that room, probably driving everyone else in the shop insane, just playing these two gorgeous instruments over and over, thinking to myself: 'How could anyone pick just one?!' As the shop was getting ready to close, I had to make a decision - the del Gesù won over the Strad, but only because of its raw power. "There were many more occasions on which René kindly loaned an instrument to me for various concerts, and I must say - each one of those experiences were just as unique," Yuzefovich said. "To be a student or even a recent graduate and have such a rare chance to perform on an instrument of that caliber is something I will definitely cherish for the rest of my life. Anne Akiko Meyers said she first met Morel when when he was working for Jacques Francais in New York and she was a 15-year-old student at The Juilliard School. "When you saw René, he always had his bright blue uniform/jacket on with his tools in his front pocket," Meyers said. "He would hit a tuner on the wall (A-440) to get you started. I always was a little nervous when I would start playing for him, knowing he had seen and heard EVERYBODY. He once told me to just relax and not think of it as an audition, which I found funny. After three or four seconds of playing, he would take the instrument and adjust it without tuning the violin down, and the violin would have a sound that would just explode with color. My eyes would always pop out in amazement at his efficiency and sensitivity. He loved that I 'sculpted' the sound. He was like a doctor, knowing exactly what was wrong with the fiddle with no explanation. It was uncanny. We asked him how he did it and he answered, 'It's the player that makes the sound.'" When it comes to lutherie, he was especially good at "color, sound, knowledge, expertise, adjusting the instrument to each player's taste and style," Meyers said. "He also had an ear like no other. He knew musicianship, character, and style of each player with one good ear! Plus, he had a great sense of humor and would tell stories about this violinist and that violinist. He cracked me up." Morel also left his mark on several generations of luthiers. "René Morel was already a legendary figure when I first began as a violin making apprentice in 1972," said Christopher Reuning, Luthier and Owner of Reuning and Son Violins. "Although I never had the privilege to learn directly from René, the legions of his students and employees spread the advanced restoration and set up techniques that he had perfected so well that they became the industry standard for all of us. 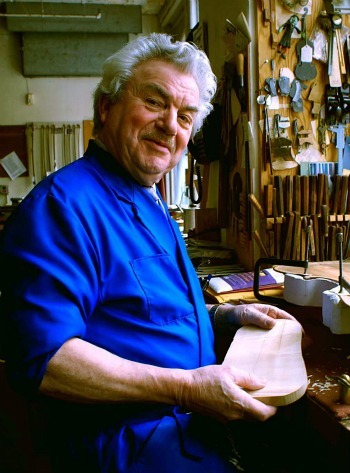 Through his association with Jacques Francais, René was the trusted luthier to several generations of the leading artists and cared for many of the world's most magnificent instruments. Despite his stature in the field, René remained a humble Mirecourt craftsman whose self-effacing charm was infectious. There were never more loyal clients than those who trusted René. In 2008, my association with René became more personal through his association with my auction company. It was then that I discovered more directly the depth of his humanity and enjoyed his humor and exceptional storytelling. He will be missed by us all." Violinmaker Guy Rabut said that "as a teacher, René was always willing to take the time to advise and guide all who stopped by the shop for advice. For those of us who worked in his shop, we received a rich resource of knowledge to draw upon for many years after. The high standards never wavered as he challenged us to do our very best work, without compromise. I have so many wonderful memories of the time I spent working in his shop. In addition to learning about violin restoration we also learned about wine, food and any other subject where René thought that we could benefit from his advice. Ultimately, he was generous and patient and allowed us to grow, knowing that some day we would be in a position to pass along our knowledge to the next generation." "He meant to world to so many who knew him," said Jonathan Solars, representative for Florian Leonhard Fine Violins in New York. "I take some comfort knowing that he is probably catching up with many of his old clients and teaching Vuillaume a thing or two about repair." How beautiful. If we could all leave such a beautiful legacy. Thanks for sharing. A tragic loss to the world of strings and the public that hears the results of his unsurpassed expertise. RIP. There is with great sadness we have received the news of the passing of Rene. Even though we knew he was very sick, the news come as a shock. He has meant so much to me and my Guadagnini over the years. His sound adjustments were always on the spot and he could read what I wanted. When I didn’t know what I was looking for in sound, Rene would come up with a suggestion which I immediately could grasp. A very important person for the whole string world has passed away. I am happy that I have had the opportunity to take advantage of his knowledge, last time at his home in October. I am also happy that Rene managed to educate a successor. He described violin maker Stefan Valcuha as his son and in this way we know that Rene’s legacy will live on.